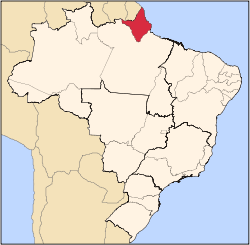 For the municipality located within this state, see Amapá (city). 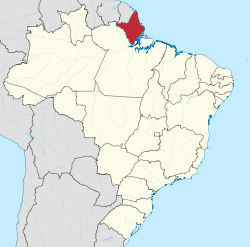 Amapá (Portuguese pronunciation: [ɐmɐˈpa]) is a state located in the northern region of Brazil. It is the second least populous state and the eighteenth largest by area. Located in the far northern part of the country, Amapá is bordered clockwise by French Guiana to the north, the Atlantic Ocean to the east, Pará to the south and west, and Suriname to the northwest. 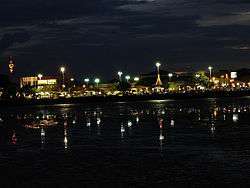 The capital and largest city is Macapá. In the colonial period the region was called Portuguese Guiana and was part of Portugal's State of Brazil. 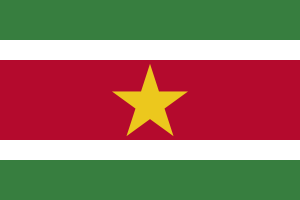 Later, the region was distinguished from the other Guianas. Amapá was once part of Pará, but became a separate territory in 1943, and a state in 1990. The dominant feature of the region, and 90 percent of its total area, is the Amazon Rainforest. Unexplored forests occupy 70 percent of Amapá, and Tumucumaque Mountains National Park, established in 2002, is the largest tropical forest park in the world. The estuary of the River Oiapoque, once considered the northernmost point of Brazil, is along the Atlantic Ocean coast at the north of the state. During the colonial era from 1637 to 1654 the Amapá region was merged into the Captaincy of Para, this was the Captaincy of Cabo de Norte. The Amapá region had the highest population of any region of Brazil in the 16th century, with an estimated population of 7 million residents. In the early colonial period the Amapá region was a rich source of lumber, resins, annatto, vegetable oils, and salted fish, all of which were exported to Europe. The French established sugarcane plantations in this period. With the discovery of mineral deposits the Amapá region was invaded by the English and Dutch, who were ultimately repelled by the Portuguese. The Treaty of Utrecht in 1713 established the boundaries between the colony of Brazil and French Guiana, but these were not respected by the French. A fort was constructed at São José de Macapá, now in present-day Macapá, as a base of Portuguese power in the region. In the 18th century, France retook control of the area. This international dispute continued until 1900. With the discovery of gold and the increasing value of rubber on the international market during the 19th century, outsider population increased in Amapá and the territorial dispute with France was brought to a head. French settlers established the State of Counani (1886-1891). The gold rush however brought in Brazilian interests who gained control of the territory, which led to clashes with the French. 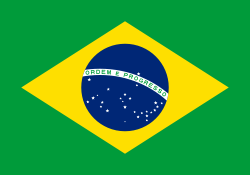 The dispute was sent for arbitration and on December 1, 1900, the Arbitration Commission of Geneva ceded possession of the territory to Brazil . It was incorporated it into the state of Pará, with the joint name of Araguari (named for the river of the same name). It became the federal territory of Amapá in 1943. The discovery of rich manganese deposits in Serra do Navio in 1945 revolutionized the local economy. Manganese remains the largest source of revenue in the state. Amapá did not achieve statehood until October 5, 1988, at the time of the promulgation of the new Brazilian Constitution. The State of Amapá possesses the lowest rate of loss of its original vegetation for any Brazilian state, estimated at only 2%. Most of the Amapá territory is covered with rainforest, while the remaining areas are covered with savannah and plains. On the Amapá coast, almost intact beaches mix with swamps, creating the largest representation of this biome in Brazil. This mixture of salt and fresh water is perfect for the food chain reproduction for several animal species. Pollution, however, is now a chronic problem in the state of Amapá. Mercury, which is used in the extraction of gold, is widely found in water sources and sewage systems in the population centers of Amapá. An equatorial climate is a type of tropical climate in which there is no dry season—all months have mean precipitation values of at least 60 mm. It is usually found at latitudes within five degrees of the equator, which are dominated by the Intertropical Convergence Zone. The Tropical Monsoon climate is denoted Am in the Köppen climate classification. Tropical rainforest is the natural vegetation in equatorial regions. According to the IBGE of 2010, there were 668,689 people residing in the state, with a population density of 4.3/km². The population of Amapá is highly urbanized, with 93.7% of the population residing primarily in Macapá and Santana. Population growth: 5.7% (1991–2000); Houses: 144,000 (2006). The last PNAD (National Research for Sample of Domiciles) census revealed the following numbers: 429,000 Pardo (Multiracial) people (69.4%), 148,000 White people (24.0%), 40,000 Black people (6.5%), 6,000 Asian or Amerindian people (1.0%). The majority of the residents of Amapa live in poverty. According to the Fundação Getulio Vargas (FGV) 36.56% of the population live on only R$ 79 per month, which the foundation considers below a decent standard of living. The service sector is the largest component of GDP at 87.6%, followed by the industrial sector at 7.8%. Agriculture represents 4.6% of GDP (2004). Amapá exports: wood 75.5%, ores 18.7%, heart of palm 5.5% (2002). Share of the Brazilian economy: 0.2% (2005). Portuguese is the official national language, and thus the primary language taught in schools. 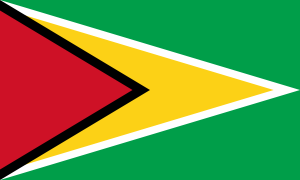 French is the second language taught in every school due to the proximity of French Guyana. A creole language called Lanc-Patuá is spoken among some of the people. The state of Amapá will soon have a new airport. Infraero will start work on the new Macapá International Airport, which will contain 17,000 square meters of space to serve 700,000 passengers a year. The current airport, with an area of 2,900 square meters, operates annually with 324,000 passengers. The work, scheduled for conclusion in 30 months, will enlarge the parking lot to 258 spots, compared to the current 80, and expand the total area from 2,400 to 11,000 square meters. The apron area will be increased from its current area of 21,000 square meters to 30,000 square meters, with capacity for four large airplanes and 30 small aircraft. 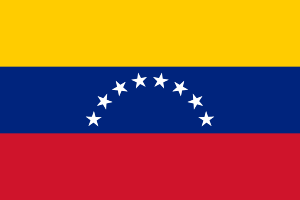 The flag was adopted by Decree No. 8 of 23 April 1984. 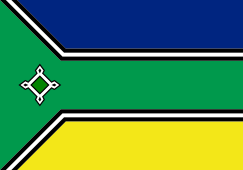 The blue represents the sky over Amapá and justice, the green represents the native rainforest, and the yellow represents the Union and its natural resources. The black stands for the deceased who worked for the state, and the white for the will of the state to live in peace and stability. The symbol on the hoist-side represents the Fortress of São José, out of which the state capital grew. 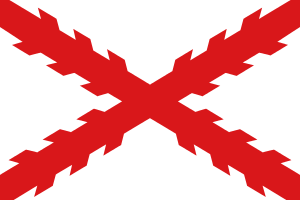 Before 1984, the state had a red-white-red flag, based on the flag of Pará, and similar to the flag of Peru. ↑ "2014 Brazilian Population Estimates" (PDF). IBGE. Retrieved March 29, 2015. ↑ "Amapá". Encyclopaedia Britannica. Encyclopaedia Britannica Inc. 2015. Retrieved 2015-02-02. 1 2 3 4 5 6 7 Presser, Margaret (2006). Pequeña enciclopédia para descobrir o Brasil. Rio de Janeiro: Editora Senac Rio. pp. 26–29. ISBN 8587864742. ↑ "Perfil do Estado" (in Portuguese). Macapá: Governo do Estado do Amapá. 2015. Retrieved 2015-02-02. ↑ Síntese de Indicadores Sociais 2007 (PDF) (in Portuguese). Amapá, Brazil: IBGE. 2007. ISBN 85-240-3919-1. Retrieved 2007-07-18. ↑ "Estimativas da população residente nos municípios brasileiros com data de referência em 1º de Julho de 2011" (PDF). Instituto Brasileiro de Geografia e Estatística. 30 August 2011. Retrieved 31 August 2011. ↑ "Símbolos do Estado" (in Portuguese). Macapá: Governo do Estado do Amapá. 2015. Retrieved 2015-02-02. ↑ "Estado do Amapá". www.vexilologia.com.br (in Portuguese). Retrieved 2016-01-05.